I recently commenced a new body of work inspired by a collection of glass photographic plates in the heritage archive of Mt Stromlo Observatory, ANU. The project was facilitated by Dr Brad Tucker from the ANU Research School of Astronomy & Astrophysics and Mr Jack Dunstan of ANU Heritage. The Stromlo Photographic Plates are historically connected to Mount Stromlo Observatory (MSO) the first major observatory in Australia and the Southern Hemisphere. 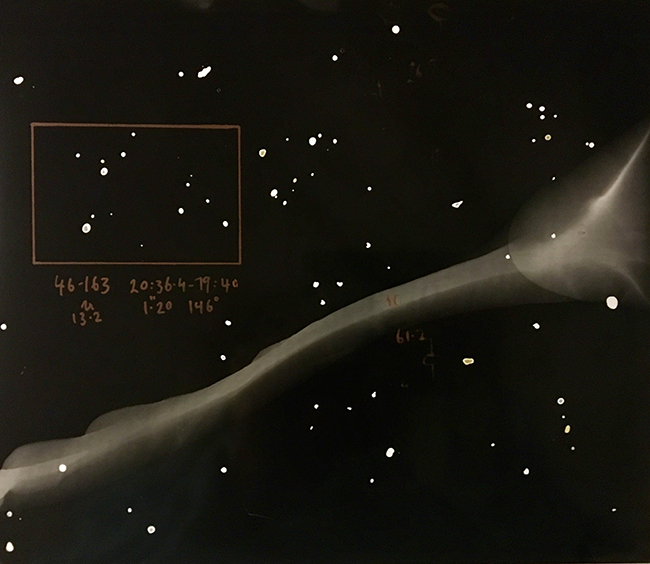 During its period of stellar astronomy, MSO produced thousands of glass plate negatives of the Southern night sky, taken over a period of four decades from the 1950s. They are unique as examples of a complete assemblage of glass negative astrophotography used for scientific research in Australia and I am particularly interested in two aspects of the collection. 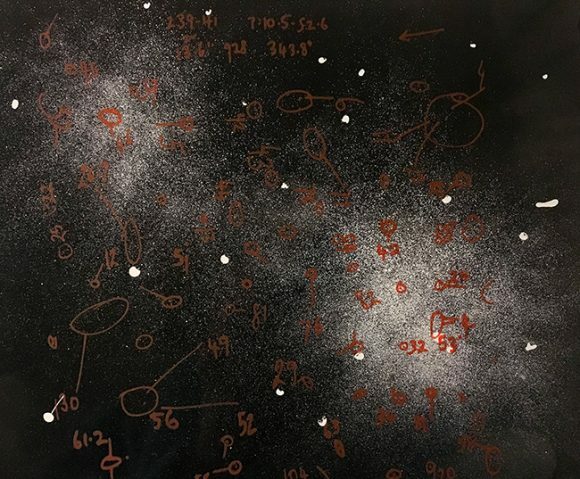 The first is the materiality of the plates themselves and how they reflect the methodology of astrophotography undertaken by observers and their assistants at the site. The notational inscriptions on the plates as well as the envelopes enclosing them offer an unfamiliar and codified language of observation. Secondly, as some of the first images of the Southern skies, the plates enable me to develop my interest in how space / the universe has historically worked as a vector for exploration, knowledge production, and cross-cultural and interdisciplinary relations ‘back’ on earth. This is related to the little exhibition I curated to explore the history of the Transit of Venus. My art around the Stromlo Plates will develop over the year ahead but the first stage will be exhibited in Connections Part One, at Megalo Print Studio and Gallery, as part of a series of art-science collaborations. In this first stage I have sought to reference both the photographic history of the plates and the plates as devices of observation and inscription. I used the chemigram process to produce my own photographic prints of an imaginary universe or suite of ‘astrophotographic’ images. By using silkscreen I was then able to apply my own notational system of marks to these images, highlighting areas of the ‘sky’ which drew my eye. These images are an aesthetic response to the aesthetics of the original plates but they are also intended to reflect on the systematic scientific method originally employed by the observers at MSO and how this language and method are unfamiliar to me and consequently difficult to decipher. I look forward to seeing how my artwork develops over time as I come to understand the research process of the Stromlo scientists and how it resulted in the images I have seen recorded on glass.